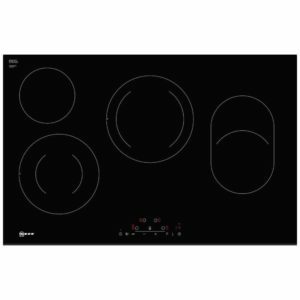 This superb 92cm wide induction hob from Neff boasts 5 induction zones, 4 of which can be combined in pairs to form large flexinduction zones. Clever TwistFire controls make use a breeze. Simply point and twist to activate your cooking zones. Plus, you can control both the hob and hood settings on your integrated appliance. With 17 power levels and boost functions, performance isn't compromised by the excellent style. Finished in black glass with a stainless steel frame it will look fantastic in any kitchen. We love the black finish and distinctive cast iron pan support with low profile burners. There's style in abundance! Not just attractive but with five fantastic gas burners there's plenty of room for your pans, with one of the burners being a wok burner for more intense heat. Neff really utilise the effective rapid response and fine control of gas with their clever FlameSelect system, allowing precise control of each burner flame so you can boil pasta, simmer sauces and sear steak to perfection every time. 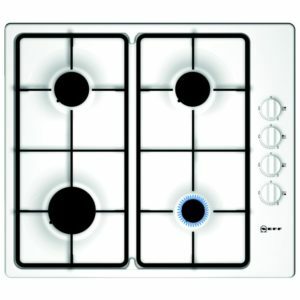 We love the flexibility offered by this brilliant 80cm wide ceramic hob from Neff. Boasting four cooking zones, two of which are dual and one is extendable for bigger pans, there's plenty of space whether you want to boil, simmer or fry! Electronic touch controls make the T18FD36X0 easy to use and with a control lock you can rest assured it won't get accidentally turned up when your back is turned! 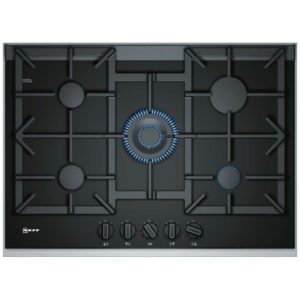 We love the versatility and ease of use of this fantastic four burner gas hob from Neff. With a powerful wok burner, ideal for intense heat, and Neff's FlameSelect system for precise power selection, you will be able to cook up all your favourite foods with little fuss. FlameSelect gives you complete control over your gas flame level. The flame adapts to any dish. Simply select one of 9 levels and you can see how the flame becomes larger or smaller depending on how you need it, just like cooking on an electric hob! Finished in stainless steel with cast iron pan supports, the T26DS59N0 has great appeal. 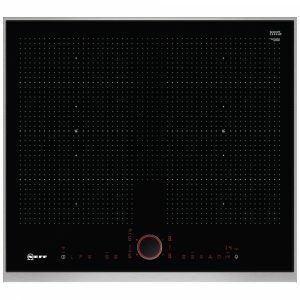 This superb 60cm wide induction hob from Neff boasts two large flexinduction zones. 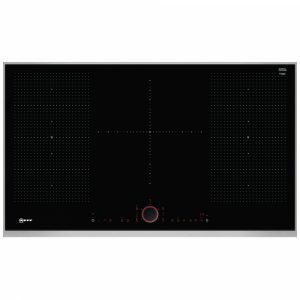 Easily control your hob with Neff's TwistPad Fire intuitive hob control. Simply point and twist to activate your cooking zones. Plus, you can control both the hob and hood settings on your integrated appliance. Finished in black glass with a stainless steel frame it will look great in any kitchen. 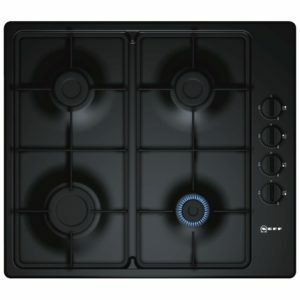 This stylish black four burner gas hob from Neff is simple and elegant. Supplied with cast iron pan supports and with hassle free controls, you will be able to focus on whatever you are cooking with ease. 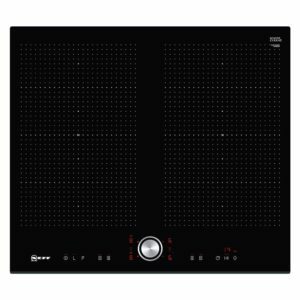 Sleek and very, very stylish is the only way to describe this black glass Neff FlexInduction Hob. 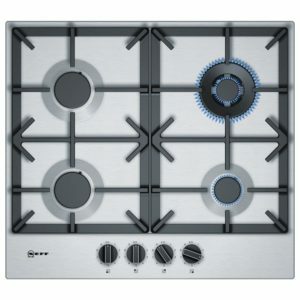 With 4 zones including 2 flexible zones, this hob offers the keen cook versatility and cooking excellence. Benefitting from 17 power levels with Power Boost on each zone, this is cooking efficiency at its very best. Each zone has its own LED display and timer with the new TwistPad control you'll have full control over your cooking. You can react to pans bubbling away quickly and easily. Simply point and twist towards your cooking zones to activate and adjust heat. Your families' safety is extremely important to Neff so they have utilised important safety features including Residual Heat Indicators, a Control Panel Lock and Safety Cut Out facility. Neff have cleverly given you dazzling good looks combined with technical excellence. What more could we ask for! 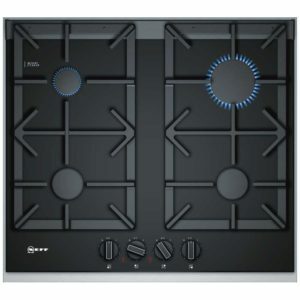 We love the fantastic design and performance of this four burner gas hob from Neff. Finished in black glass with cast iron pan supports the design is simple and effective. Easy to use controls and LED power displays ensure you can cook with ease, and with the FlameSelect feature, you can have complete control over your gas flame level. The flame adapts to any dish. Simply select one of 9 levels and you can see how the flame becomes larger or smaller depending on how you need it. 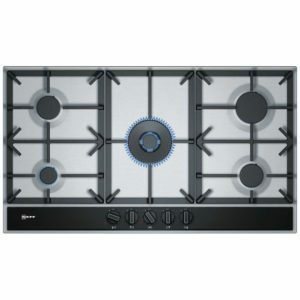 This easy to use four burner gas hob with uncluttered design makes the focus the cooking! Finished in white with black cast iron pan supports, its cool lines will look elegant in any kitchen.